U.S. cruise ship, Adonia, docked on Monday at Havana harbor, becoming the first U.S. cruise ship to cross the Florida Straits in more than half a century. About 700 passengers, including some Cuban-Americans, arrived on the ship, which belongs to American company Carnival, were warmly greeted by local residents waving flags from both nations. The move represents another step forward after U.S. President Barack Obama and Cuban President Raul Castro, announced a historic rapprochement in December 2014. “Everybody is so excited that we are here. We are so humbled and proud as a corporation to be the first to come from America. It is a tremendous experience,” said Carnival CEO Arnold Donald. 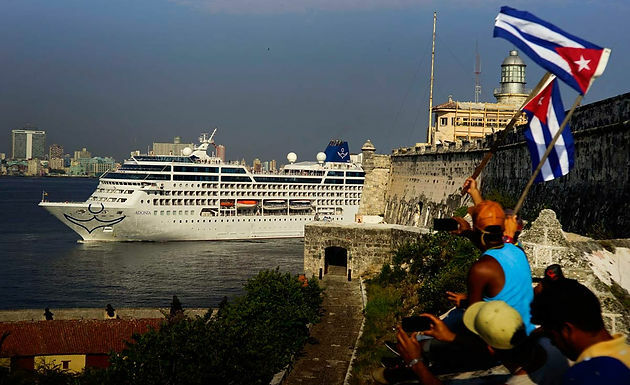 Carnival says the cruise will sail twice a month from Miami to Havana, at a cost of 1,800 U.S. dollars per person, for a seven-day circuit of Cuba with stops in the cities of Cienfuegos and Santiago de Cuba. The trips include on-board workshops on Cuban history and culture and tours of the cities that allow the trip to qualify as “people-to-people” educational travel, avoiding a ban on pure tourism that remains part of U.S. law. However, for the American passengers, this represents a moment of change and true engagement with the Cuban people. “This is such a great opportunity for us to have this exchange between America and Cuba. We are very happy to be here,” Joyce Warner, an American passenger, told Xinhua. For the Cuban-Americans among the passengers, the trip also represents a unique opportunity to bring them closer to the country they once left and an emotional moment after years of separation from their homeland. “This is the first time I have come back in 47 years and I am very excited and proud to be here. I hope this brings many good things for the Cuban people,” said Milly Martin, a Cuban Carnival employee in Miami. Meanwhile, others like Maritza Poveda wished this rapprochement could have happened earlier but still hopes it can bring both governments and peoples together after more than 50 years of hostility. “This first cruise means the beginning of something very big for Cuba and Cubans, both for those who stayed and those who left. We hope that this will bring many changes for the Cuban people,” added Poveda. It was also the first time Cuban nationals were allowed to enter the country by sea since 1961. A Cuban law prohibiting people born in Cuba from entering the island by sea had almost delayed the cruise but was lifted by local authorities over a week ago. Victor Velozo, president of Havanatur, the local travel agency that negotiated the historic voyage with Carnival, highlighted the importance of opening up the cruise business to the U.S. market. “These cruises should grow as it can bring very good revenue for both sides and can also show our beautiful country to travelers,” said Velozo. Experts in the U.S. believe cruises to Cuba could generate 300 million U.S. dollars in revenues to the companies involved, including 88 million U.S. dollars during the 2016-17 season, if all the companies that wish to sail are given the required approvals by both governments. Before the 1959 Cuban revolution, cruise ships regularly traveled from the U.S. to Cuba.